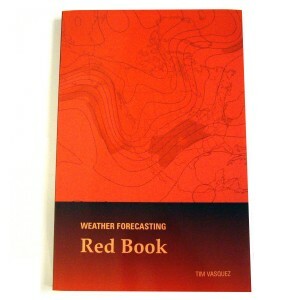 These forecasting books are designed for practicing meteorologists. Because of their readability they are also perfect for hobbyists, broadcast meteorologists, storm chasers, pilots, flight dispatchers, and anyone who deals with forecasts on a regular basis. The technical level spans the entire range of intermediate to advanced in an easy-to-understand format. Excessive introductory content and complicated math are omitted, and the concepts and examples focus squarely on actual forecast considerations, real life cases, and those rare bits of wisdom that make or break a forecast. For university students, the experience distilled in these books contains valuable insight into the forecast process that simply isn't conveyed by a curriculum that focuses mainly on theoretical meteorology. 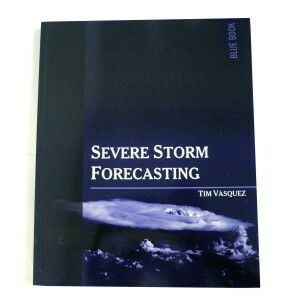 All books on this page were written by Tim Vasquez, who served as a forecaster for nearly 10 years in the US Air Force and ran the Chase Hotline forecasting service during the 2000s. He developed the Digital Atmosphere analysis program and numerous other weather utilities, tools, and education software programs, and lives in Norman, Oklahoma. Released in 2017 Instability, Skew-T, and Hodograph Handbook provides a full background on working with skew-T diagrams and hodographs. Math is kept to an absolute minimum, the text has a friendly tone, and the information starts out simple and then builds on the existing text. Learn how these diagrams work, what all the lines mean and how to use the charts. Nearly every known severe weather index is covered, including newer parameters like Significant Tornado Parameter and Critical Angle. Informative notes in the margin help clarify the material and provide related historical and technical background. Each chapter has a summary section and and 20 questions. This is where it all begins: your guide to the basics of meteorology and forecasting. You'll start with the basic building blocks, covering bits of physics and meteorological units in an enjoyable, readable style. It's all then put together as we review dynamics and structures of weather systems, ranging from baroclinic highs to frontal systems to hurricanes. There are special chapters for convective weather, i.e. thunderstorms, and winter weather. Lots of trivia, notes, and facts can be found throughout the margins. This book is an excellent read for beginners and an easy-to-read review for professionals, covering that unique operational slant that a degree program might have missed. There are thousands of meteorological charts on the Internet. Where do you start? What are they for? Which chart is right for a certain job? 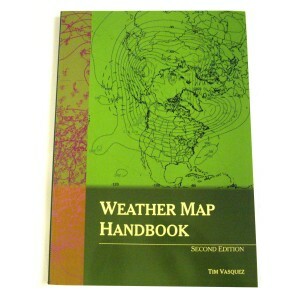 Weather Map Handbook helps make sense of it all. Dozens of key weather charts are explained one by one, with details on what they represent, what they're normally used for, how to analyze them, and things to look for on them during the forecast process. There are even suggested websites for where to get each of the charts. 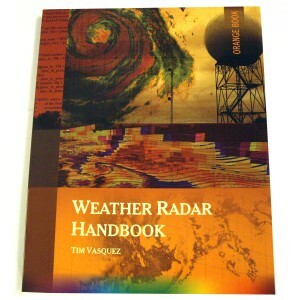 This book is an essential introduction for amateur forecasters and a handy reference for the forecast desk. For those who live in central or eastern North America, Severe Storm Forecasting is a must-have on the forecast desk. The content is exactly what its title suggests: severe thunderstorm fundamentals from a forecasting perspective. Special attention has been paid to the chapters on thermodynamics and shear, which cover the most important part of this topic in an easy to understand style. A set of chapters focus on the main elements of severe weather: tornadoes, lightning, and hail. The final chapter at the end puts it all together, explaining how to anticipate and predict severe weather. Our first full color title! Weather Radar Handbook explains everything you need to know about using the latest generation of Doppler and polarimetric radar. The art and science of interpreting severe weather and other radar signatures are explained throughly from an operational perspective using readily available tools such as GRLevelX and RadarScope. The first chapters outline the basics of radar theory and electromagnetism in a very readable format. There's a minimal amount of math here to help reinforce concepts. Then storm structures are outlined and compared with radar signatures, with important features and patterns explained. There's a special chapter on velocity products, plus another chapter on polarimetric products, which are rapidly becoming a mainstay of forecasting in 2013. Many examples and case studies are revealed in depth, with cross sections and even 3-D views. As usual, the margins are full of information relating to the radar topic being discussed. This can be considered the "shop guide" for forecasters. Most of our weather books focus on weather and the process of building a forecast. This book is a unique reference guide that focuses on the building blocks themselves, providing a compendium of almost all known algorithms, techniques, and classifications used by practicing meteorologists. We've drawn on a wide range of material, from NWS Tech Memos to UK Met Office forecasting guidelines to create this unusual and very handy guide. There's also reference tables and coding/decoding sections. 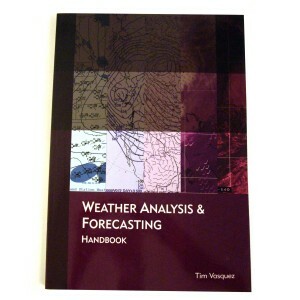 This book does not explain how to forecast; we recommend the Purple Book for that. But if you've got the basics down, the Red Book is the one you'll constantly be reaching for. Storm chasing is a hobby and profession that has grown rapidly in the past 20 years. This book is not about storm chasers but serves as an introductory guide for aspiring chasers or just anyone interested in severe weather. 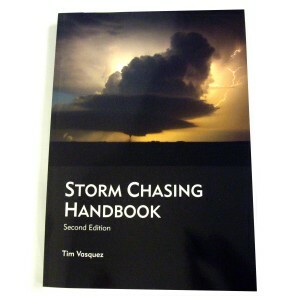 Various chapters focus on equipment, forecasting, close-range tactics, safety, and much more. The book is lavishly illustrated, contains hundreds of margin notes, and features specially commissioned artwork drawn by David Hoadley, the pioneer of storm chasers. A large travel section in the back highlights routes of interest in the Great Plains, with everything from geology to restaurant picks. 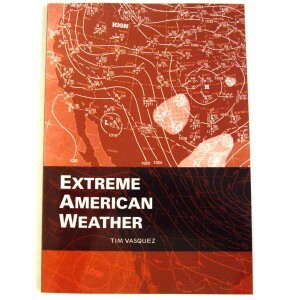 This eBook presents a series of case studies of unusual, damaging, and extreme weather events in North America, ranging from arctic outbreaks to severe weather to windstorms. Rather than focusing on the damage and the human element, this book examines the meteorology behind each event, showing what the surface and upper air charts revealed and presenting a "John Madden play by play" of the elements that created the weather system. After studying this book, you'll have a firm idea what to expect when bad weather is on the way and weather charts are at your disposal. Instant download. Released in late 2016, Forecasters Reference Workbook provides operational forecasters with essential charts they need to complete the analysis, diagnosis, and forecast process. In today’s meteorological community, the vast majority of information is gathered by computer programs and websites. These don’t have the degree of fine detail that the vellum poster-size maps offered from years ago. In this volume we collect all of the most essential charts in an economical color book and provide multiple copies in blank form.